Yes, geese again for today’s April daily photo. I think we’ve all heard by now that (as previously mentioned) there’s a Goose Management Scrutiny Review Task Group. Its report is on the agenda at a meeting tomorrow. I thought we could do some goose scrutinising of our own. Let’s have a gander at this goose pictured above, and think about its many goose buddies. The ancestor of most domestic geese, the greylag is the largest and bulkiest of the wild geese native to the UK and Europe. In many parts of the UK it has been re-established by releasing birds in suitable areas, but the resulting flocks (often mixed with Canada geese) found around gravel pits, lakes and reservoirs all year round in southern Britain tend to be semi-tame and uninspiring. ‘Uninspiring?’ Our goose is offended. And I disagree. I think they’re very interesting, our geese, and even inspiring. I had an email back in autumn from a friend who had seen a skein of greylag geese flying in from the north, honking loudly over the riverside area in Clifton as they’d approached, landing on the Ouse, around 30 of them, honking and splashing. This goose pictured above had rings on both its legs. I’ve noticed before that some of them are ringed. I know nothing about the subject of bird ringing, so perhaps anyone who does understand why this goose has two could add a comment. This goose, like the earlier group pictured, was in the Memorial Gardens area close to the river Ouse. But as ten years has passed, I assume it’s a different goose. Although perhaps not. They can live a long time, apparently, so who knows, it may be one of those geese from 2006. I have quite a few photos of it as it walked towards me, and I’d have liked to include them all, as actually I like geese, admire them often, and particularly the slow and gentle way they walk, carefully placing their big feet. This one approached me in its slow deliberate way, then turned its head away after while, perhaps because I wasn’t going to feed it anything, perhaps because it’s tired of being scrutinised. Since mentioning the subject of ‘York’s problem geese’ (as the headlines tend to put it) earlier this month I’ve tried to read more information in the reports available, as this apparently pressing issue is on the agenda at the council’s Executive meeting tomorrow. There’s reams and reams of information, covering the perceived problems caused by the large populations of geese, ideas of how to manage this and reduce numbers, and information on how other places have tried to deal with their goose populations. The fact that we now have a ‘Task Group’ with a long-winded title looking at the local geese has caused widespread amusement (and bemusement) and has meant that the subject has got more attention than it did before. But York’s geese have appeared occasionally in the headlines in past years. The concern seems to be mainly centred around Rowntree Park. Not a place I visit much, as I’m over the other side of town. But is it really that bad? It’s a big park, surely there’s room for everyone, including geese? I’d like to put the other side of things. My perception is completely different, as someone who walks through town often, along the riverside and near the riverside areas where the geese are apparently a ‘problem’. All I see is people observing the geese and enjoying them, taking photos of them, smiling at them, and particularly when there are obvious families of geese with goslings, as there are at the moment. When I walked through Tower Gardens a few evenings back a group of adults, apparently a family group of different generations, were gathered around a family group of geese and goslings, with one taking a photo while they had a discussion about how lovely it was. No problem there then. And no problem anywhere else I’ve noticed the local humans interacting with the local geese. Twitter is full of photos people have taken of geese crossing roads and holding up traffic, and these photos are widely liked and shared, and make people smile. 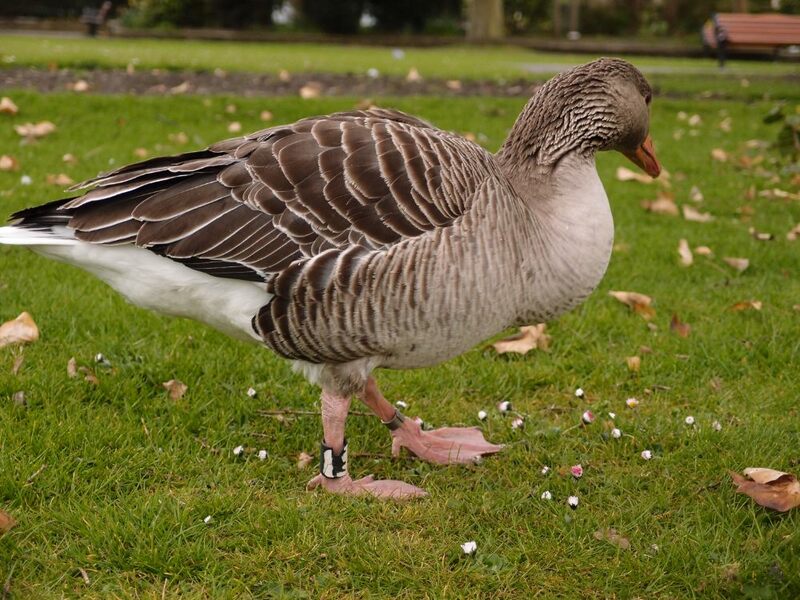 According to the report (PDF) ‘Canada & Greylag Geese have adopted a residential strategy in York’. So they’re clever too. My reading seems to have confirmed what I wondered on a page some time back, that the tatty-looking state of the flowerbeds in the Memorial Gardens may be due to the geese eating the plants. There’s an obvious solution to that: plant things they don’t like eating, perennials or shrubs perhaps instead of those expensive temporary bedding plants. Preferably bee-attracting plants. And as regards the ‘droppings’ … again, in most areas by the river their (small) ‘droppings’ blend in to the natural environment rather more easily than the coffee cups, plastic bottles, cans, crisp packets etc, and occasional piles of vomit left by passing humans. Not far away from the Memorial Gardens, across the road in the now rather uninspiring non-space of the ‘Triangular Gardens’, there’s a rather neglected pond/water feature thing which may be doing its bit to control the populations of geese, in being an area of water that the small goslings get into but then can’t get out of, owing to its concrete sides and generally wildlife-unfriendly design. If you’re passing by and have any concern about animal welfare perhaps you could check the gloomy pool to see if there are any stranded young geese, and lift them out, as others have recently. And perhaps we could ask why that pointless pool is still there, if all it does is cause distress to stranded goslings. Or perhaps its a cost-effective way of reducing numbers? Apparently the council receives complaints every year about ‘the geese problem’. How many? What percentage of the general population is complaining? Has anyone worked it out? Is that in the report perhaps? I haven’t had time to read it all, and I doubt the councillors voting on it have either. Yes, the Canada geese are photogenic too aren’t they? I’ve got quite a few photos of them too. Including a photo from some years back of a lady feeding them – which is now quite frowned upon it seems.